Why not kick off 2017 with a new WordPress Theme that is going to attract new business, wow your customers and showcase your products or services in the best way possible? Or if you are a blogger you can choose between several premium and clean blog themes. PremiumCoding has a range of WordPress themes designed to impress and right now they are offering 40% off all themes as well as 40% off yearly and lifetime membership. <b>NEW YEAR, NEW WEBSITE – 25% OFF PREMIUM CODING WORDPRESS THEMES</b> Why not kick off 2017 with a new WordPress Theme that is going to attract new business, wow your customers and showcase your products or services in the best way possible? Or if you are a blogger you can choose between several premium and clean blog themes. PremiumCoding has a range of WordPress themes designed to impress and right now they are offering 40% off all themes as well as 40% off yearly and lifetime membership. PremiumCoding was founded in 2010 as a two-man operation designing, building and uploading themes to ThemeForest on the Envato Market. They launched their own theme club in 2015 and haven’t looked back since. Today, the company currently has 28 WordPress themes, five team members, and over 30,000 customers. They add a new Theme on a 4-6 weeks basis. PremiumCoding focuses heavily on blog themes. All of their themes have blogging capabilities, and they even offer a dozen themes designed specifically for professional and personal blogs. Every Premium Coding Theme comes with premium support. If you ever have any questions or need a hand pronto, a dedicated tech will be on, hand to make sure any problems are ironed out as quickly as possible and that your website is functioning flawlessly. 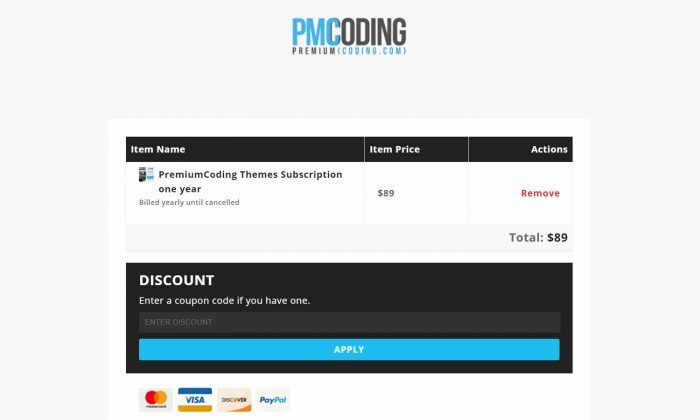 Premium Coding themes are available for one-off purchase or by purchasing a membership. Premium Coding membership options come with a lot more perks including unlimited licenses, free access to PSD design files on applicable themes, and unlimited use on different domains. 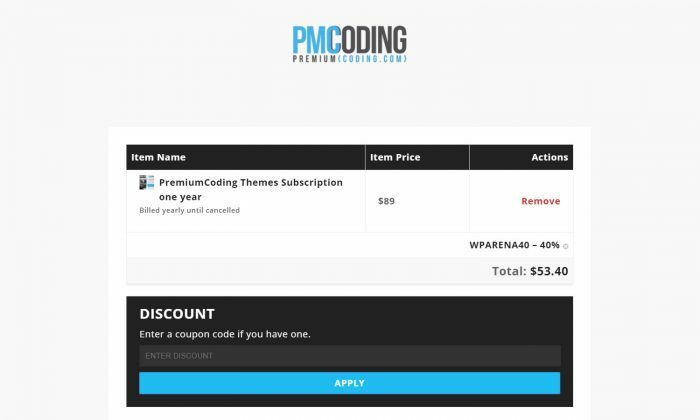 Using the PremiumCoding coupon code is very simple. Add your Theme or subscription to the cart and proceed to checkout. On the last page of the process, you will notice a label named Coupon Code. Enter the code below and click Apply and your discount will be applied instantly. and after applying the coupon code, you will get 40% OFF. Let’s have a look.